Are you looking for something really fun that the whole family can enjoy? Back To The Roots has the perfect project grow your own garden and harvest your own foods. Best of all you can do this right in the comfort of your own home! It takes very few simple and easy steps and you will have your own homegrown foods. We grew the Mushroom Farm and I was amazed. I have always wanted to garden but could never get anything to grow. I always over watered, under watered or planted in the wrong season but every attempt I made was either unsuccessful or yielded very little. With Back to the Roots I thought there is no way mine will grow. To my surprise me and the kids followed the simple instructions and look what we ended up with. Our very own tasty mushrooms! The picture below is when they first began popping up. After about a week they began to get really big and you could see they were ready to harvest. I thought and thought about what me and the kids could make that would be healthy and would go with our natural growing experience. I wanted to teach the kids that natural foods can be just as good as chicken nuggets and pizza. Look how big our mushrooms grew. We did a healthy meatless spaghetti with mushrooms it had so much more flavor with the oyster fresh grown mushrooms. The whole family loved it. Here in Kentucky everyone gardens and I have always wanted to have success in growing something. Back to the Roots made the possible for me and my family. 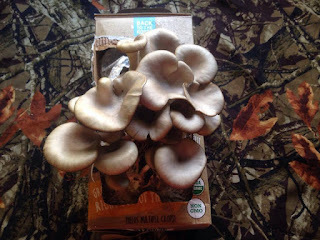 All I had to do to grow my Mushroom Farm was cut a cross in the box, open flaps, scrape away the top white layer, soak it in water, place back in box, and basically leave them alone in a nice place not in direct sunlight. From there you just spritz them in water and wait to see them grow. You even get an added bonus to grow after your mushrooms are done; heirloom tomato seeds. I will keep you guys updated on how they do! Back to the Roots is one of the best products we have reviewed so far in 2017 so I will be adding it to our Newest and Best Products of 2017 Guide. All my loyal readers know we do the newest and best guide every year and we only add the newest and best products. Make sure to check out Back to the Roots site and be sure to follow them on social media below. Also for every Mushroom Farm purchased one is donated to a school when you submit your picture here on their site.